Increased use of (relatively abundant) land, rather than improved technical efficiency, has been the main driver of agricultural production growth in Africa south of the Sahara (SSA) over the past five decades. However, rapid population growth and the adverse effects of climate change are increasingly putting pressure on land availability, land fertility, and water access. Given the well-documented positive impact of agricultural research investment on agricultural productivity growth, it is critical that African countries step up their investment in agricultural research and instate sound policies to promote technological and institutional innovations in the agricultural sector. 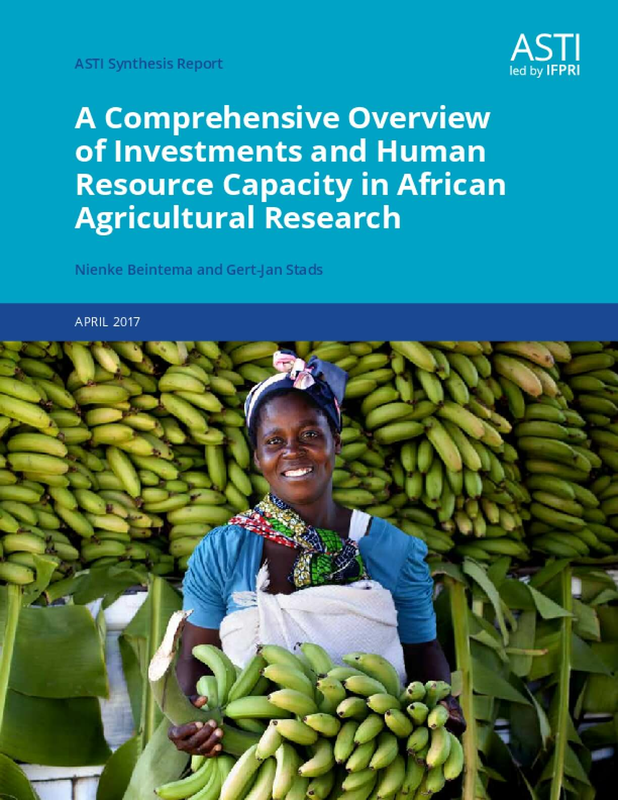 This report assesses trends in investments, human resource capacity, and outputs in agricultural research in SSA. It highlights the cross-cutting trends and challenges that emerged from ASTI's country-level data, structuring it within four broad areas: funding capacity, human resource capacity, research outputs, and institutional conditions. Agricultural research spending in SSA grew by nearly 50 percent between 2000 and 2014. However, underinvestment remains widespread, with 33 out of 40 countries for which data were available spending less than 1.0 percent of their AgGDP on agricultural research. Across SSA, agricultural researcher numbers increased by 70 percent during 2000–2014. However, a very large share of senior PhD-qualified researchers are approaching retirement. Without adequate succession strategies and training, significant knowledge gaps will emerge. Female scientists remain grossly underrepresented in agricultural research, despite the fact that they are in a unique position to effectively address the pressing challenges facing African farmers, the majority of whom are female. Donor dependency and funding volatility remain critical in a large number of African countries. Outdated research facilities and equipment are impeding the conduct of productive research, which compromises the number and quality of research outputs and ultimately translates into reduced impact. The report concludes by outlining a number of policy measures that SSA governments can undertake to address the various challenges related to agricultural research funding, human capacity, outputs, infrastructure, and institutional structure.